Pharmacy Act 53 of 1974, Medicines and Related Substances Act 101 of 1965 and Selected Rules & Regulations is designed to assist pharmacists to comply with these SAPC requirements as stipulated in the GPP. 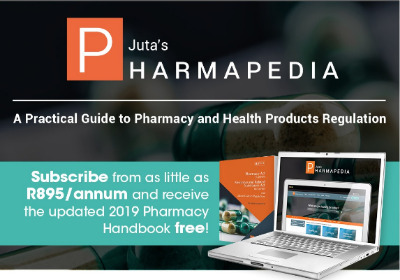 Pharmacy Handbook 2019 is complimentary for subscribers to Juta's Pharmapedia. Visit www.jutapharmapedia.co.za for more information, to register a free trial or to subscribe.